Mo is an extra large male that raced 84lbs. He is very tall and is one of the tallest dogs we have adopted out. He is a gorgeous bright red boy with a white blaze and white feet and chest. Mo hides his age very well and doesn't have any white on his face yet to give his age away. He has very long legs and prances when he trots and is still just stunning at 9 years old. Mo has been in an adoptive home for 6 years and is looking for a new home only because of some financial trouble his family had. Mo was a good racer when he raced and got up to A level at Southland in Arkansas. He raced 78 races. We also adopted out his sire Hey Zohar and his dam Lofty Girl and many of his littermates. 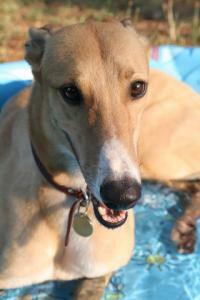 Mo loves to play and be silly for a short time but is mostly a couch potato. He is excellent on leash and loves to go for walks. He loves to get up on the couch or on the bed to snuggle with his people. He is very outgoing and isn't bothered by much. On New Years he slept though the fireworks, totally unconcerned. He loves people and will follow you around. He is a more dominant, confident boy so would probably do best in a home with females or other males that aren't real dominant. This is a sweet, loving guy that has been one of his foster home's favorite fosters ever. He shows no prey drive towards cats or small dogs and has lived with them in his previous home. He also lived with a toddler in his previous home.